Our recruiting handbook will help you navigate today's accelerated recruiting process and learn practical tips for featuring yourself to college coaches. A recruited athlete was 30% more likely to be admitted than a non-athlete. For comparison, an African American, Native American or Latino was 28% more likely to be admitted than a Caucasion or Asian and a legacy was 20% more likely to be admitted than an applicant of a parent that did not attend that college. Lacrosse recruiting is essentially supply and demand. 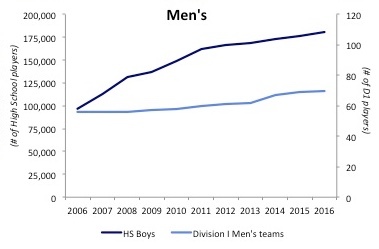 In this case, the demand or number of talented, high school recruits is growing much faster than the supply or number of available roster spots on college teams. In 2006, there were 40 high school players competing for every Division I Men's roster spot. In 2016, there were 55 players competing for the same spot. 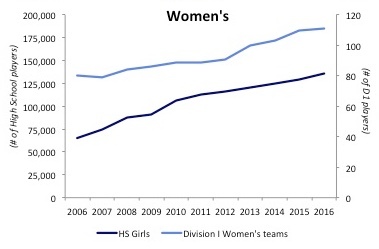 Women's lacrosse has seen competition increase from 31 to 40 over the same period.